We have finished the first round of fieldwork in all our four case study cathedrals and we have gathered plenty of fascinating data. For today’s blog entry I have chosen the topic of saints. In the Middle Ages, saints and their relics were the main attraction of pilgrimages; during the Reformation shrines were demolished and lots of saints were simply forgotten about. Nowadays, with the revival of interest in pilgrimage and cathedrals, saints have once again started to appear in the foreground. Thomas Becket, William of York, John Southworth and Cuthbert are the saints associated with our case study cathedrals. How much do contemporary visitors know or want to know about saints? How do cathedrals present their saints? How important is it for a cathedral to have the physical remains of a saint? The Martyrdom of Thomas Becket is the main focus at Canterbury. Guides have to follow the ‘Becket route’ – the places inside the Cathedral associated with him. It is always interesting to observe deviations from the metanarrative. I talked to volunteers who said that there is ‘too much of Becket’ and ‘he was here only for 5 minutes and was not a very saintly figure.’ Some suggested that it was only thanks to the brutality of Becket’s murder that pilgrims started to come and bring in the money. For some, St Dunstan is equally important – but since unlike Becket St Dunstan lived to an old age and died peacefully surrounded by fellow monks, he is now almost forgotten. I met a pilgrim who came to Canterbury because of Anselm. Where there was once a magnificent shrine to Becket, there is now empty space. ‘Becket’s bones’ is quite understandably a topic that people like to speculate about. Indeed, one senior figure of Canterbury Cathedral told me that some people say they know where Becket’s bones are; but actually at the moment they can tell the ageless story of Becket and the moral issues, and that fits in very well with the ethos of the Cathedral. ‘Mystery serves us better than actuality,’ he said. Visitors to Durham Cathedral can see the tombs of Cuthbert (an Anglo-Saxon saint and bishop) and Bede (the greatest scholar-monk of the Anglo-Saxon period). As a side note, several people go on ‘Celtic pilgrimage’ to Durham Cathedral and are then told that their saints are Anglo-Saxon, not Celtic. The only Celtic saint they have is Aidan. On 20th March I went to Durham to attend St Cuthbert’s celebrations. There were three events that day, including St Cuthbert’s Day’s Festal Evensong and Procession. All of these were very well attended, indicating the continuing drawing power of Cuthbert. The overall impression was that the sentiment of being ‘Cuthbert’s people’ is really very strong there. In Canterbury there is a pub called The Thomas Becket; in Durham there is no Cuthbert Inn or similar. Is it just a coincidence or would naming a pub after St Cuthbert be sacrilege, as one visitor suggested? She said: ‘People think of Becket as a man and Cuthbert as a saint. Becket was a bishop who was murdered in the cathedral. Cuthbert was a saint.’ Somebody else said they would love a pub called St Cuthbert’s Arms or similar, and added that Cuthbert would have been a good customer. Indeed, one can buy St Cuthbert beer. 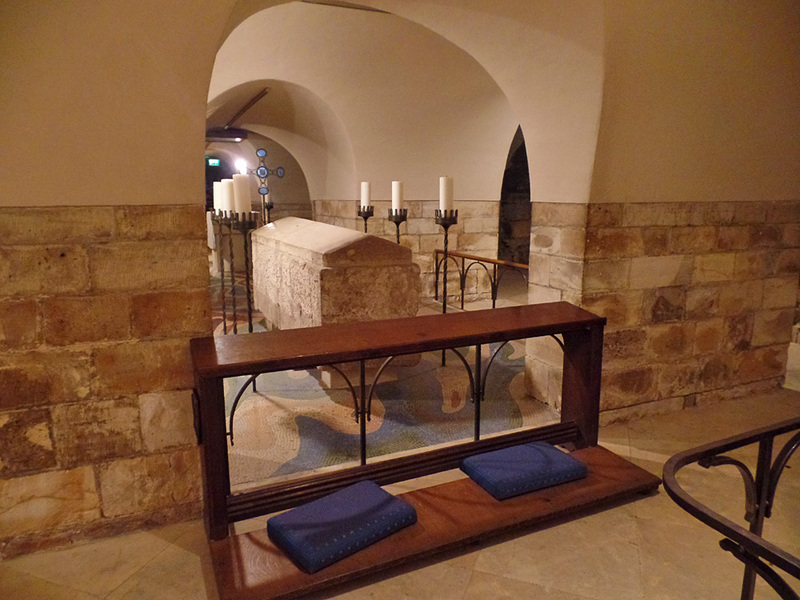 In the western crypt of York Minster there is a Roman sarcophagus containing the remains of William Fitzherbert – a twelfth century archbishop, who was poisoned during mass. William never made it to the ‘Premier League’ of saints nationally. People seem to be a bit uncomfortable about St William. There is a sort of feeling that he is perhaps a bit less legitimate than other saints: the fact that he only became a saint because people did not drown when falling off the Ouse Bridge does not seem to be convincing. There is no sign at his tomb; neither the crypt nor St William is part of guided tours (with few exceptions); even his name is not mentioned often. Many people I spoke with said that the remains of a saint are irrelevant; what matters is that for hundreds of years people have made a pilgrimage to holy places, including cathedrals.